This November in Venom #158 we will be baring witness to a showdown between Venom and Kraven the Hunter. In Lethal Protector Part 4, Venom and Kraven square off for their final battle! From previous issues we know that Stegron the dinosaur man has created a mutated group of dinosaur people, who are now living below New York’s streets. Venom/ Eddie Brock must protect them from Kraven, who is searching for the ultimate prize. 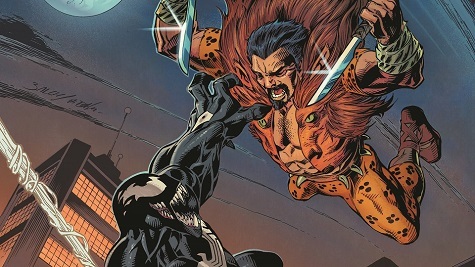 Kraven, an undying hunter, is usually an adversary of Peter Parker/Spider-Man. His half brother the Chameleon is another villain also shows up with regularity in Spider-Man’s adventures. It’s great to see Kraven back in a story arch that definitely suits his character. Mike Costa and Mark Bagley are crafting this tale. Bagley of course was the artist responsible for the first Venom: Lethal Protector saga back in 1993. Venom #158: Lethal Protector Part 4 will be available in comic book stores from November 29th.